Proper maitenance is important in keeping your ServeManager account operating as efficiently as possible. From time to time, an incorrect entry, or mistake, may cause an inconvenience when entering in job information. Maybe an old company or employee is in your way. This guide will help you resolve those issues without losing your data or changing job information. Archiving is the easiest way to remove unnecessary information from your view, without information loss. By changing your filter to archived, you can then view everything that was placed there. There are two ways to archive a job. The first is to edit the job and press the archive job button in the upper right corner. The second is to select the jobs you would like to archive, on the jobs screen. Then use the mass options menu and select archive job. If unnecessary court case or court location information is listed in your auto-populated list, when creating a job, you can remove that information from the list by archiving it. Select the Court Case button from the left toolbar. Then select the court case in question. In the upper right corner is the archive court case button, press that button to archive the case. Court locations can be archived by selecting the court locations tab, and then the specific court location. From here you can press the archive court location button. Archiving employees removes them as an option to assign to a job or to email them. To archive an employee, press my account then the employees tab. After selecting the employee, you can then press the archive employee button. The routes screen can be cluttered with old routes. To archive these old routes, select jobs from the left toolbar, and then the routes tab. You can then select one of these old routes, and select the archive route button. To archive either a client or a contractor, first select companies from the left toolbar, then select the company. In this screen you can then select the archive company button. If you have entered duplicates of a company, you will need to reassign the jobs to the correct company. For contractors, first select the instance of the company that was entered in error, then select the jobs tab. 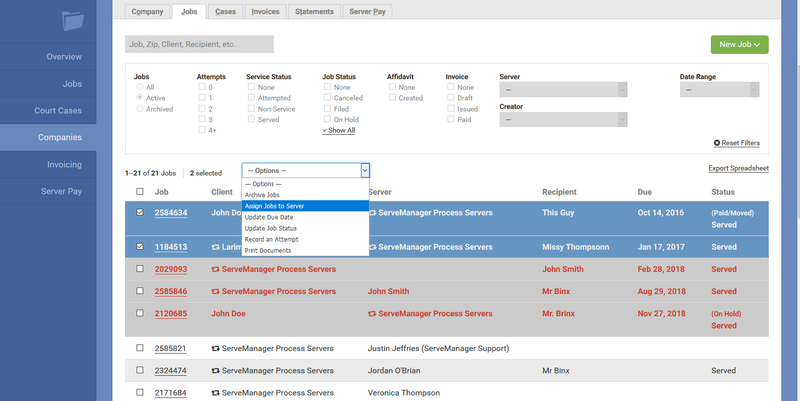 Here you can select all of the jobs, and then use the mass options pull down to select assign to server. Assign the jobs to the correct instance of the company, and archive the erroneous instance. For clients you will have to select the client, and then the jobs tab. Here you will have to open the jobs, edit, remove the client and manually select the correct instance of the client. When finished you can archive the erroneous instance. There are other items that may auto-populate when entering in job information. Things such as plaintiffs, defendants, document titles and recipients may populate information that is no longer necessary. To remove these entries, they will need to be deleted. Deleting anything from Servemanager is permanent, however deleting these entries will not remove or change any information already entered in your jobs. To delete these entries you will need to select My account and then the settings tab. For plaintiffs, defendants, and document titles, select the manage button for auto-complete fields. For recipients, select the frequently used recipient manage button. Select the entry you wish to remove, and then select the delete button. If you need any assistance with cleaning up your account, feel free to contact us.